The culprit: a weak disturbance moving southward down the coast and relatively cool air over the interior. The latest radar shows the precipitation pattern. On the coast, the precipitation is rain, and the interior stuff is quite light. Seattle should stay dry, as should eastern Washington. We do not have super cold air over us, but evaporative cooling is allowing the snow level to drop to the surface in some locations. Here is forecast surface chart for 10 AM this morning. You can see the low (solid lines are pressure) off the southern WA coast, and the temperatures (at around 2500 ft, shown by shading) indicated the cold air over eastern Washington and cool air over the western WA lowlands. This is NOT going to be big snow event. Here is the model forecast from this morning, showing the 24-h total snowfall prediction over the region. Not more than about 1-2 inches in the most favored zones. Nothing over the Seattle Metro area (sorry, Jim Forman). 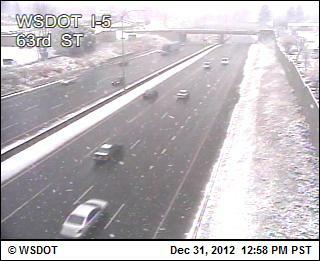 Portland gets some white stuff. But one piece of good news...after this low moves south of us, expect a lot of sun on Tuesday. New Year's will start on a bright foot...an excellent omen for the new year. After one of the most dismal periods of incessant clouds and rain in a long time, we are finally getting a break. Here is the precipitation forecast for the next 72h. Although the NW coast will get some precipitation on Monday afternoon, most of western WA and Oregon will be dry. What a wonderful opportunity to clean leaves out of your gutters and rake up leaves in your sodden yards....or to enjoy an outdoor walk or bike ride. But with a wet surface and high pressure over the region (with attendant weak winds and clearing skies at night), expect a lot of fog, particularly in the morning. And if the temperatures drop below freezing, then roadway icing could be a threat. Why are so many trees falling? During the past few weeks the stories have been incessant. 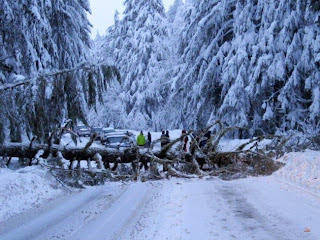 One major highway after another has been closed for extended periods recently as hundreds of snow-encased trees have fallen over the roadways, including SR-2 across the central Cascades, the Mount Baker Highway, RT 6 and 101, on the Olympics Peninsula. Large deposits of snow weighted the trees down until they toppled over. A number of cars have been hit, nine people injured and tragically two were killed on December 21, just east of Leavenworth. The Mt. Baker ski area was inaccessible for days and folks had to go the long way around (I90, 97) to get to Leavenworth and vicinity. Long-time Washington Department of Transportation maintenance personnel say they have never seen a situation like this, with snow causing such extensive and long-lasting tree fall periods over state roadways. I have been around for a while and can't remember an analogous situation. 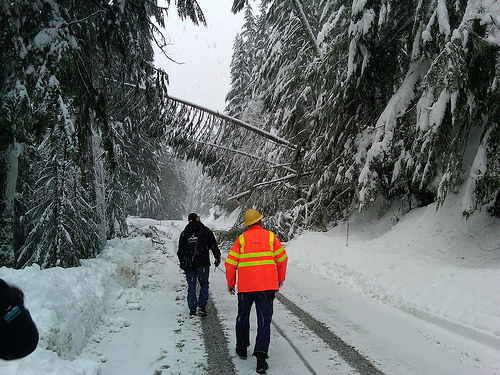 The threat was so large that WSDOT began flying over the road with helicopters, in the hope of blowing off snow. So were the trees falling? We have had periods of more snow, of more wind, of more rain. Periods that were colder. What is different this time? 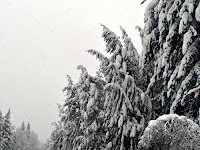 The last month has been a wet one over the region and the mountains have gotten large amounts of snow. But other years have had as much or more snow in the mountains (e.g., 98-99) without so many trees coming down. So snowfall alone is not the answer. The Mount Baker Highway tree falls occurred east of Maple Falls (see map, east of red A). Elevation about 1400 ft.
U.S. 101 on the Olympic Peninsula was closed between Shelton and Brinnon with trees downed not far from sea level. So the elevations varied. I think there is an answer. There is something that all these elevations had in common during the period, something that I believe caused massive tree falls. So let me give you my hypothesis. Let's consider the facts, my dear Watson. 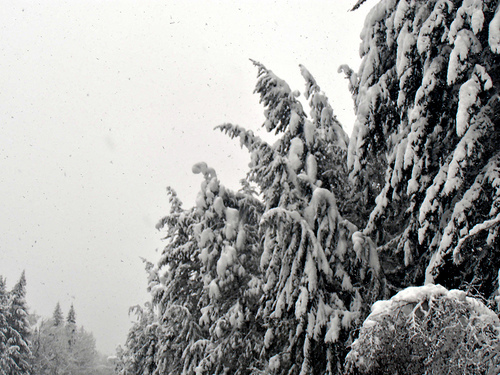 Fact 1: We know that the trees fell when they were weighted down with snow. Fact 3: During really cold periods (our Arctic outbreaks) snow tends to be lighter, less sticky, and more easily blown off trees. Fact 4: Major warm up periods (e.g., pineapple express atmospheric river periods) have very high freezing levels and rain at most elevations, resulting in melting and washing off snow from trees. There WERE some unusual aspects of the past few weeks that allowed large amounts of snow to stick on trees until they fell over. Thinks about it. This month we did not have any major Arctic, cold-air, outbreaks. So no really cold, light snow that doesn't stick well. We have NOT had any pineapple expresses or warm up periods that would melt the snow at a wide range of elevations. 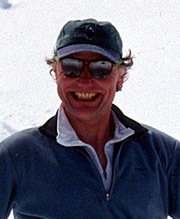 In fact, recent temperatures in the mountains have been AMAZINGLY steady. Let me demonstrate this. Take a look at the temperatures (red daily high, blue daily low) at the Winton weather station run by the WA DOT. Winton (MTWINT, roughly at 2000 ft MSL) is several miles north of Leavenworth on RT 2...not far from the tree falls. Or Nason Creek (a bit farther north at 2000 MSL as well). Only minor temperature variations. Temps never got above 40F and only below 20F on the 18th and 19th. Most of the two weeks (Dec 7-21st) before the major tree falls on RT 2 had highs in the low 30s and lows in the mid 20s. 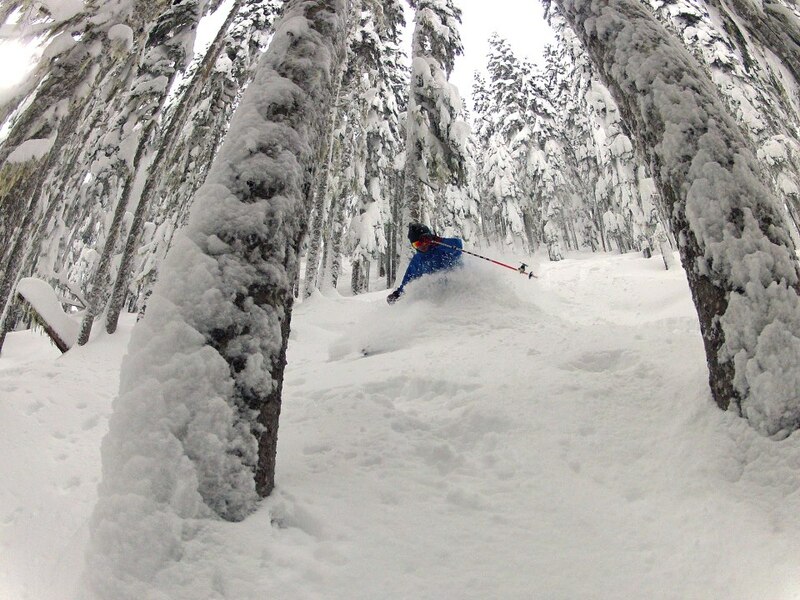 Perfect temperatures to deposit snow on trees. And winds were generally light...and thus not blowing snow off the branches. This is a very unusual situation. What about the Mt. Baker Highway tree falls? Lets consider the Maple Falls station (a bit lower--670ft--than the section with the tree falls). AGAIN, amazingly constant temperatures in mid-December, with highs in the mid to upper 30s and lows around 30F. Go a little higher, to where the trees were falling, and temperatures were surely cooler..right in the range of maximum stickiness and deposition. But you ask, what about the trees (less numbers) falling near the Hood Canal? Surely, it was much warmer there? The answer is no....that area can be unusually cool for the lowlands, as southeasterly flow banks cool air over that area. Consider Lake Cushman, which is close to sea level, and on the SE side of the Olympics, not far from 101. A number of day had highs in the lower to mid thirties, starting December 19th. And yes, temperatures were relatively constant. So my hypothesis is that we had a wet, snowy period with consistently cool, but not super cold, temperatures in a range that promoted sticky snow. No major wind events to blow off snow. No pineapple express warming. It all game together in a very unusual way, causing massive snow loading on trees. Another contributor might be the mild temperatures that have left the ground unfrozen and thus less able to hold the trees in place. 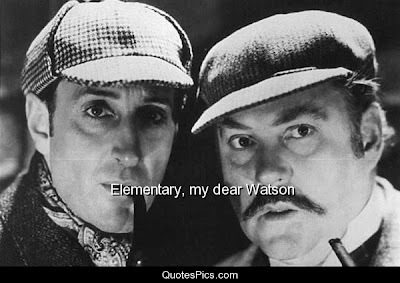 Perhaps one of you have an alternative theory...if so, I would like to hear it! We have been through a very wet period during the last month, with lots of precipitation in the lowlands and heavy snow in the mountains, but it looks like a break is coming up that should allows us to dry off a bit, and yes, see a glimpse of the sun. Seattle has had around 48.5 inches of rain so far this year, about 12 inches above normal. To get a view of how we got so wet, here is a plot of the normal cumulative rain (blue) versus what has actually hit the airport (red). Two wet periods stand out: late winter/early spring and this fall (after roughly 20 October). 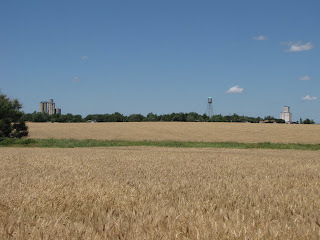 And, of course there was our dry spell during the late summer/early fall. Do we have a chance of any records? The greatest annual rainfall at Sea-Tac was 55.14 inches in 1950. There is little chance we can reach that in a few days. Only three years (including 1950) got above fifty inches...there is a good chance we will get close to that level. In any case, we will "enjoy" living in one of the top 10 wettest years since 1948. But the pattern is a changing.... the latest NWS Climate Prediction Center 6-10 day forecasts show drier than normal conditions over the Pacific Northwest. The origin? Persistent ridging (high pressure) over the region with a few glancing blows, mainly to our north. The European Center Model has very little precipitation over the lowlands during the next week, and even the U.S. GFS model takes most of it to the north and south of us. This weekend looks fine, with only a few showers around. No serious weather. The snowpack is not only bountiful, but it is unusually good condition, since we have not had many warm rain periods to turn it into Cascade concrete. Very few wet/warm atmospheric rivers this year. As shown below, much of the region has 150% or more of normal snow water equivalent (amount of water in the snow). So the skiing is very good. Talking about skiing, today was the last mountain/avalanche forecast of a mainstay of the local mountain weather community, Mark Moore. Mark has been the leader of the NW Weather and Avalanche Center for years, and his work has not only immeasurably strengthened this crucial local resource, but has undoubtedly saved many lives. We owe him a real debt and wish him the best. By the way, the NW Avalanche Center deserves your support, particularly if you depend on their mountain weather and avalanche forecasts. The latest Seattle Times/NY Times articles on the Tunnel Creek avalanche deaths shows how important the NWAC is and why you should listen to their warnings! It's all about mountain slopes. So much of our interesting weather is associated with air moving up and down our substantial terrain and tomorrow will be a stellar example. Huge weather contrasts will occur tomorrow over the lowlands. In some locations, wind will gust to 60-80 mph--as strong as Hurricane Sandy--while 20-30 miles away you will barely feel a breeze. In some lowland locations there will be not a single flake, while 20-30 miles away nearly a foot could snarl traffic. We are lucky to live in such a place. Imagine being in IOWA or KANSAS where you could drive for hours and barely notice a chance in the weather. If you live in Seattle, you can CHOOSE whether you want to experience boring rain, hurricane force winds, or a major snowstorm...all within an hour's drive or ferry ride! Christmas Storm 2012 will strike tomorrow. I know the TV stations will have something better: The Santa Storm, Holiday Express, etc. And the Weather Channel will give it some scary name: Storm Boris or something. At 10 AM tomorrow a low center will be parked off our coast, precipitation will be moving in over the region, and a very large pressure difference will develop over the Cascades. With strong southeasterly winds over the Cascade crest and a big east-west pressure difference over the mountains, we have a very good set up for very strong easterly downslope winds on the western Cascade slopes and adjacent lowlands of western Washington. Enumclaw, Black Diamond, North Bend and many eastside communities will get hit hard, with wind gusts reaching 50-70 mph in a few places. Trees will fall. Power will fail. And strong winds will occur in the Strait and over the offshore waters. Forget your sailing lessons unless you want to end up in the mid-Pacific. Here are the predicted maximum gusts (in knots) at 1 PM tomorrow from the super-high resolution WRF 1.3km resolution model. Wow. Gusts reaching 60 knots over parts of the Strait and offshore of the central WA coast. 45 knot (52 mph) gusts along the western Cascade foothills at that time (with some higher values). What about snow? The National Weather Service and I are generally on the same page (SE of the Olympics is the focus), but they are going for the possibility of a few inches over Seattle and vicinity. Looking at the latest runs, I believe it will be too warm for snow in Seattle and that the powerful easterlies will dry things out enough to lessen the snow chances near sea level around the Seattle Metro area. Here is the latest WRF model forecast. First, the 24h ending 4 PM Christmas Day. 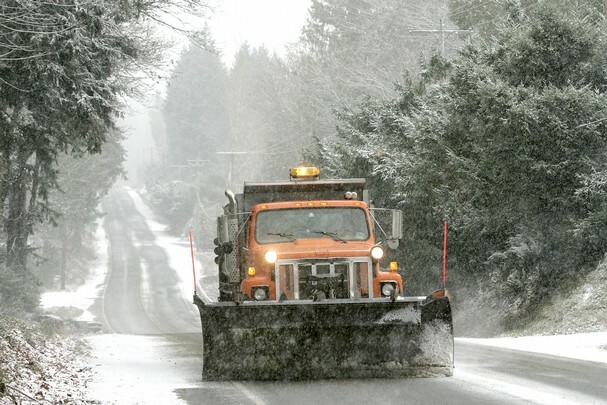 Same story as yesterday: Kitsap and Mason counties get the brunt of the lowland snow. The next 24-h (ending 4 PM on Wednesday). Eastern Washington's turn! But although I think the above is the most probably scenario, the snow level could descend toward the high hills of the lowlands if the precipitation is heavier and the easterly flow weakens more than forecast. This is a classic Seattle snow forecasting problem: temperatures are marginal and everything depends on precipitation rate and the temperature/humidity structure of the air above us. By the end of the afternoon it will be too warm for snow that is clear. But I have learned not to be too confident about Seattle snow and freezing rain forecasts. Roads are relatively warm right now. Here is the latest air and road (boxes) temperatures from Seattle SNOWWATCH. Elevated and non-elevated roadways are in the 40s. That is good place to start. If clouds come in soon enough tonight, temperatures will not fall too much and even if few flakes hit the road, they will melt quickly. Snow in the Lowlands on Christmas Day? 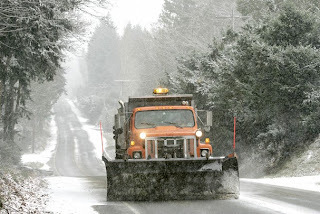 The National Weather Service has special weather statement out right now about the potential for snow over the western Washington lowlands and some of the TV stations have already started the drumbeat. As I will describe below, MOST of you will not see any snow accumulations, but some places (like western Kitsap County and Mason County, southwest WA) might get substantial accumulations. And lets not forget eastern Washington and the mountains, both of which should enjoy snow on Christmas Day. Snow plow near Silverdale. Courtesy of Kitsap Sun. We are close enough to the event now that I have some confidence in the general picture of what will happen...but snow forecasts are always hard ones. Let me explain the meteorological situation and why Kitsap/Mason county are often snowy when the rest of the lowlands are wet. 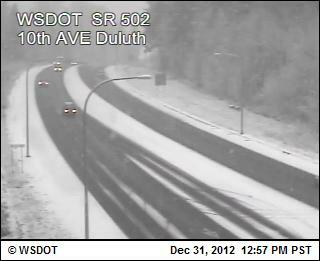 The first thing to keep in mind is that the current temperatures are marginal for lowland snow. We really don't have very cold air over us, with the snow level at 1500-2000 ft. The snow level will fall a bit during the next day (by about 500 ft). Plenty cold for snow in the mountains and eastern Washington, but not for the west side. After a relatively dry Monday, a fairly strong weather system will approach us. As illustrated by the forecast map at the surface for 7 AM on December 25th, a warm front will approach that morning. The solid lines are pressure, the colors are temperature (white, blue and purple are colder), and surface wind barbs are shown as well (click on image to blow it up). You will notice modestly cooler air over western Washington. The front will be accompanied by precipitation and moderate to strong southeasterly flow. Strong southeasterly flow will be forced to rise up over the Olympic Mountains--in fact the lift starts tens of kilometers upwind of the Olympics. Thus, there will be heavier precipitation over Mason and Kitsap counties. Here are the winds, temperatures, and pressures at roughly 5000 ft at 7AM on Tuesday. You can see the strong southeasterly flow and the cooling occurring over and immediately upstream of the Olympics. The central and eastern Puget Sound are a bit in the rainshadow of the Cascades (the southeasterly flow sinks on the western slopes of the Cascades and sinking air kills precipitation). In marginal situations, places with less precipitation (like Seattle in this case) will be mainly rain (perhaps a few wet snow flakes mixed in on the hills), but areas with heavier precipitation rapidly turn to snow as melting of snow falling from aloft progressively cools the air air, pushing the snow level down to the surface. (heavier winter precipitation around here virtually always starts as snow aloft). Let me show you the details! We can take the model forecasts and plot the wind, dew point (blue line), and temperature (red line) with height. Here is such a plot at Shelton, WA (Mason County, upstream of the Olympics) at 7 AM on the 25th. The x axis is temperature and the y axis is height in pressure (850 is about 5000 ft). You can see the southeasterly winds at low levels and the temperature is almost exactly 0C (32F) in the lower atmosphere. Why 0C? Because snow is melting in that entire layer! And the air is saturated (red and blue lines are on top of each other). A Kitsap classic. But what about Seattle? Here is the same type of plot at the same time. The air is saturated (temperature and red lines are not on top of each other) and the air temperature is above freezing for a few thousand feet above the surface. Rain and disappointed kids. Lets look st the 24-h snow maps for periods ending 4 PM on Tuesday and Wednesday. You can see the Kitsap and Mason county snows, and in fact it extend to Grays Harbor County as well. Portions of SW Washington may see some light snow, as the higher suburbs east of Seattle (e.g., Somerset neighborhood in Bellevue, Issaquah Highlands). The next day, with warmer air, the snow is over over the west, but large parts of easterly Washington, including around Spokane and Wenatchee should be whitened up. Here is the predicted snow for the next 72 hr. The Cascades will get plenty, particularly over the southern sections (e.g., Crystal, Mt. Hood!). There are some uncertainties with this forecast (e.g., heavier precipitation more snow) and it would not shock me if Portland received a significant dusting. But I would be surprised if the general picture shown above is not correct. Temperatures are warming during the day, so if Seattle had a little wet snow during the initial stages of the event, it would turn to rain in a few hours. The purple colors are the heaviest snow on the map, virtually all of it over the mountains of the Pacific Northwest and southern B.C. Yes, I have to give credit to our neighbors to the north (but that is a short drive for us anyway). 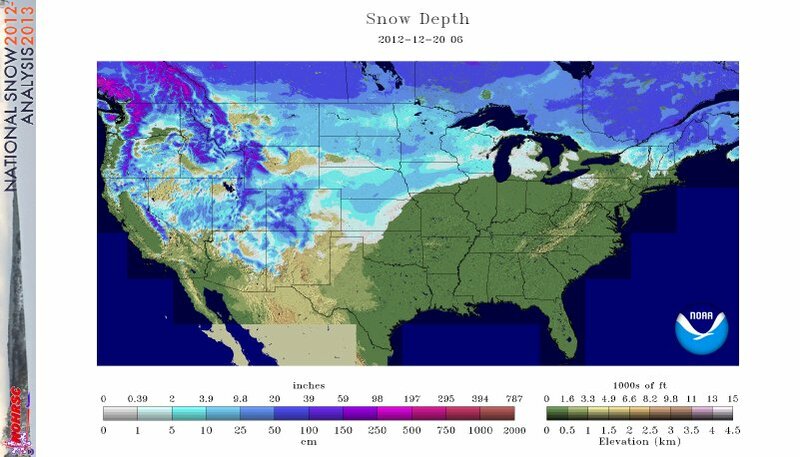 How does the current snow pack compare to normal? Be prepared to be impressed! Nearly all of Washington State is very much above normal, with nearly 250% of normal in the Olympics and around 150% of normal in the Cascades. The northern Rockies are in good shape too. Another winner is the Sierra, with roughly 150% of normal near Tahoe. Poor Colorado, they are substantially below normal, but they did get quite a bit recently. "Tuesday was a powder feast with the best snow conditions many of us have ever skied. It was deep, light and bottomless. Smiles were large, high fives were in abundance and the words "best day ever" were heard as skiers and boarders gathered at the end of the day." You could imagine appropriate triumphal music in the background. We have had so much snow lately that one ski area (Baker) is closed. The heavy snow of the past week has caused at least one hundred trees to fall along the Mt. Baker Highway, closing the road, probably through the weekend. Pretty frustrating, considering there is a 150 inch base at Baker's Heather Meadow ski area. So will the gods of snow continue this boon to local skiers? Grease your skis and prepare your bindings. Here are the 500 hPa upper level charts for two times during the next week. We will consistent troughing (low pressure) over the eastern Pacific, which produces a cold, showery pattern over the region. Continuous accumulation of snow. No warm rain to ruin things. The jet stream and main action will go south of Washington, and southern Oregon and northern CA should get some historic quantities. To show you this, here are the snow forecasts for the next two 72 h periods from the UW WRF model forecasts. For the next few days the Sierra and Siskiyou Mts. will get hammered with many feet of snow (yards in some places). We will slowly enhance our snowpack and BC/norther Rockies will get substantial amounts. For the second 72 hour period the snow accumulation is more evenly distributed up and down the coast, with over a foot of snow enjoyed by all. Eastern Washington and Oregon get plenty. All and all, a nice Holiday gift for those who enjoy winter recreation, and the amounts should not be heavy enough to mess up the roads. Record Water Levels in Seattle: Why Did It Occur and Is Global Warming Important? On Monday morning, during a modest windstorm, the Seattle tidal station (NOAA gauge 9447130) measured the highest water level since measurements there began in 1901. The results was beach flooding and damage to docks, beachfront homes, and other coastal facilities (see pictures below). Now we didn't beat the old record by much. Water reached 14.51 feet and the mean low water mark exceeded the previous record, 14.49 feet, set in January 1983, by .02 feet. Well, a record is a record, even if you win by a whisker! 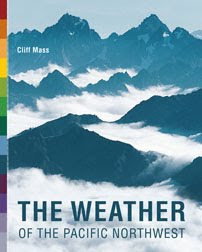 The media, such as the Seattle Times, had some big headlines on this new record, and some of them suggested that either global warming had a hand in this, or the high tide was a warning of things to come: "Yesterday's tide would be an everyday tide by midcentury." So what is the truth about this sea-level record? 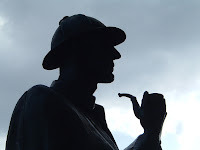 Why did the record occur on Monday? Some of the answers might surprise, perhaps. The high water on Monday had a number of contributing factors. 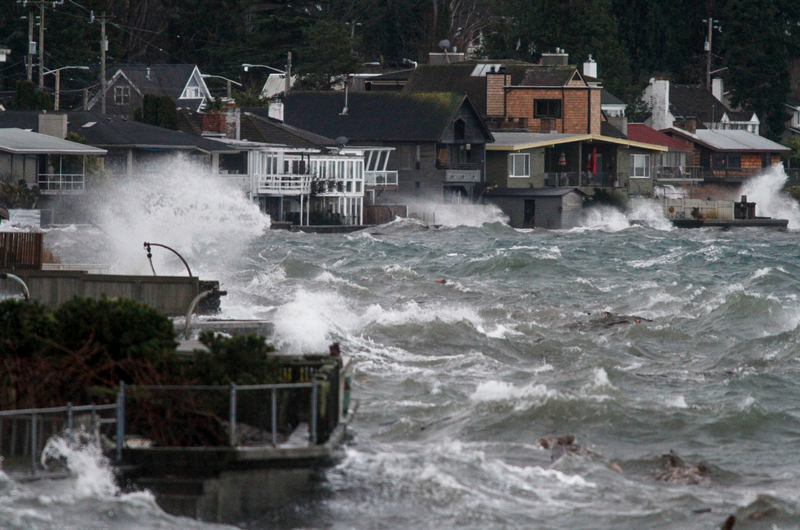 First, we started with astronomically very high tides, sometimes called "King Tides", that occur during midwinter. Tides are mainly caused by the gravitational attraction of the moon, but the sun also contributes. The highest tides tend to occur when the sun and moon are lined up, which happens during a full/new moon, and when the moon is closest to the earth (perigee). During our midwinter, the sun is closest to the earth (discussed in an earlier blog), and thus its gravitational attraction is stronger. 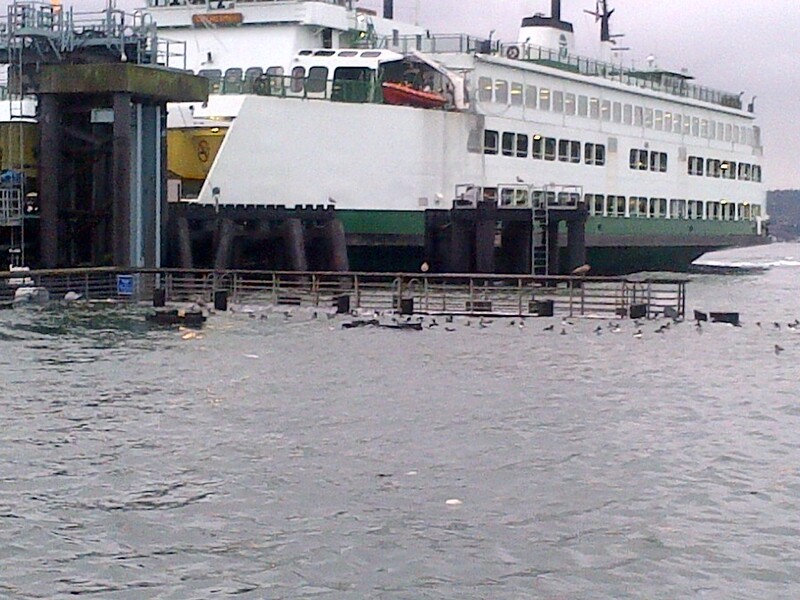 The result, the highest "King" tides. Nothing to do with a certainly local TV station. Centered on January 2, the earth is closest to the Sun, enhancing the tides. The following figure shows you the predicted tides, what actually happened, and the difference on Monday (12/17), Tuesday, and part of Wednesday (time in GMT). Our big observed tide occurred around 1600 GMT (8 AM) Monday. The predictions were too low. Why? The big reason is that we had a strong low pressure area over us (the storm) and low pressure caused sea level to rise. around 980 mb, with the lowest pressure around 0900 GMT (roughly 1 AM), hours before the astronomical high tide. If average pressure is about 1013 mb, the pressure dropped to about 33 mb below normal, which would bring the water level up by about 33 cm or about 1.1 feet. This is one reason why the difference between actual and predicted was largest in the early morning hours. Another factor that brings up sea level is the storm surge effect, the influence of strong winds pushing water up on the beach. 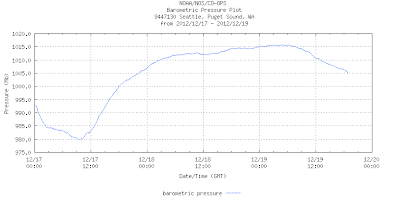 At Sea Tac Airport, the winds switched from southerly (roughly parallel to the shore) to SW (more of an onshore component) around 2-3 AM, and the winds increased rapidly during the early morning hours (see graphics). The implication is that we were lucky: the storm hit too early to maximize the water level. It if had hit 4-6 hrs later, the tides might have been a half a foot or so higher. Then we would have really had a record! 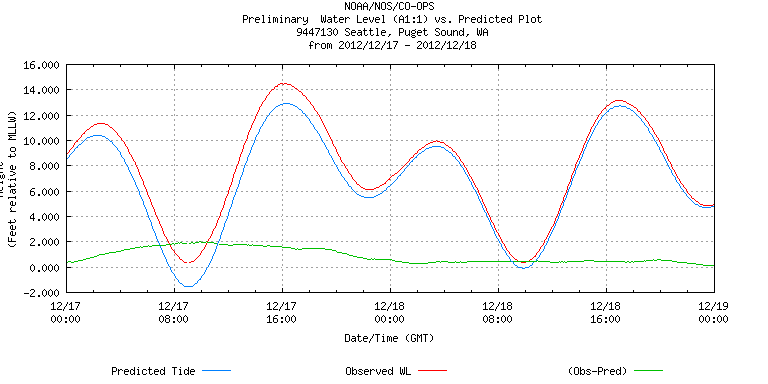 We have King tides every year, but how often do we get 980 hPa lows like Monday's storms? Well, lets check the UW records back to 1996. 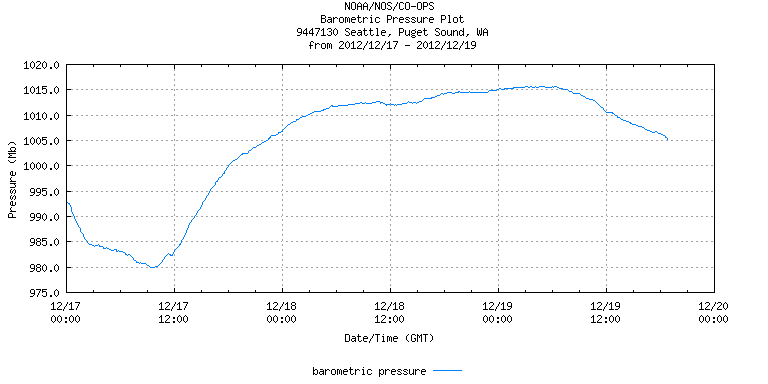 Here is a plot of sea level pressure from Sea Tac for the period. Looks like we get that low approximately every other year. It all came together for this storm. 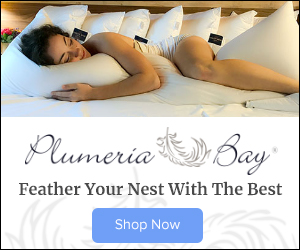 What about sea level rise? How did it contribute? 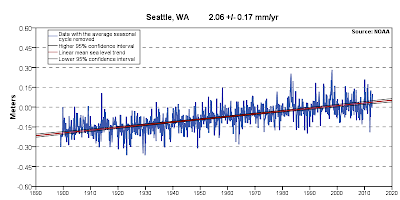 Here is the sea level rise over the past century at Seattle. An upward trend of about 8.1 inches over the last century. But if you look closely and ignore the trend line, you will see there really little trend during the past 30 years. Much of the trend in sea level rise began before humans could have had a large impact on sea level by increasing greenhouse gases (human influence becomes significant around 1970). So both natural and anthropogenic (human-induced) warming has contributed to sea level rise in Seattle. Sea level rise is making such records easier to break, but it is important to keep in mind that local sea level has not changed since the time of the previous record (1983). Interestingly, the eastern Pacific is a region where sea level has not been rising recently. To illustrate this, check out a figure from the IPCC (2007) report (IPCC is collection of international scientists working on the global warming issue). This graphic shows change in sea level from 1985-2010 from satellite data. In our area, general sea level has remained the same or fallen! In the long term, the earth will warm profoundly from increases in greenhouse gases such as CO2 and that will surely cause substantial increases in sea level everywhere. 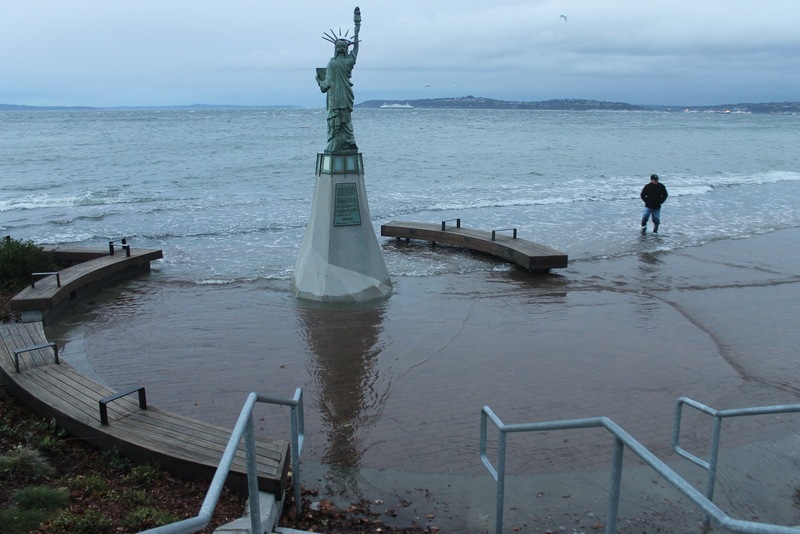 But we must be careful in pointing the finger at human-caused global warming for extreme weather events today, such as the high tides in Seattle during our Monday storm. Major Wind Event on Monday? Lewis and Clarke's Big Mistake?